As we really start getting into the middle of winter, we tend to prefer heartier food that gives us energy and keeps us warm. Traditional Czech cuisine was shaped by long cold winters without fresh produce and so is heavier and can have a high fat content. It has also been influenced by its neighbours, Hungary and Germany. More meat is eaten than fish, probably because the country is so far from the sea and is therefore more expensive, but some freshwater fish are popular. Pork, beef and chicken are the most used meats but game, goose, rabbit, lamb, mutton, duck and turkey also feature in major Czech dishes. Dumplings, or Knedlínky, come in many forms. Big dumplings are steamed and sliced and served with many different dishes. They can be wheat or potato-based and are often made with wheat flour and stale bread. Smaller, round potato dumplings are also filled with smoked meat, spinach or sauerkraut and served with fried onion, braised cabbage or spinach. Potatoes are a Czech staple as is buckwheat, millet and pasta. 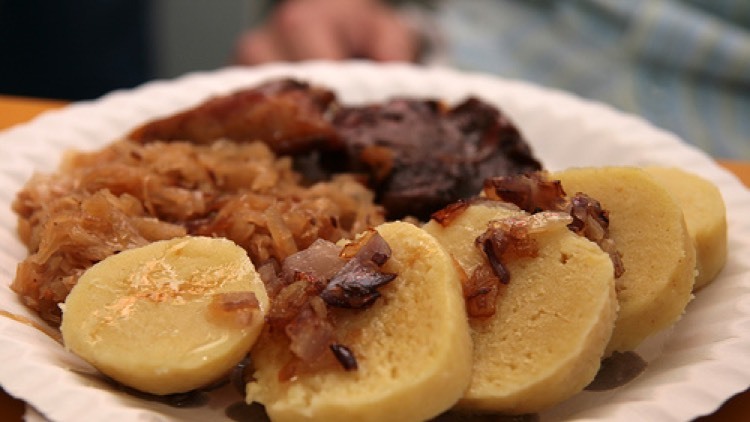 Vepřo-knedlo-zelo (Roast pork with cabbage and dumplings) – the Czech national meal! Roasted pork – leg, shoulder or belly – served with stewed pickled red or white cabbage (sauerkraut), or fresh green cabbage in season, and Knedlínky. Svíčková na smetaně (Sirloin in cream sauce) – one of the most popular Czech dishes, roasted beef sirloin in a root vegetable cream sauce, served with Knedlínky. Smažený řízek (Schnitzel) – thin, beaten pork, chicken or veal steak coated in flour, egg and bread crumbs, pan-fried and served with boiled potatoes or potato salad. Roast duck or goose – a very popular Czech speciality, seasoned with caraway seeds and honey, and served with stewed sauerkraut and Knedlínky. Jehněčí kýta se špenátem (Lamb with spinach) – Rump of lamb roasted with rosemary and garlic, and served with spinach/spinach puree and Knedlínky. Bramboráky (Potato pancakes) – fried pancakes made of raw grated potatoes, sausage, herbs and spices (marjoram, garlic and pepper). Houbová smaženice (Wild Mushroom scrambled eggs) – fresh wild mushrooms sautéed with onions, garlic and eggs. Usually served with toast.